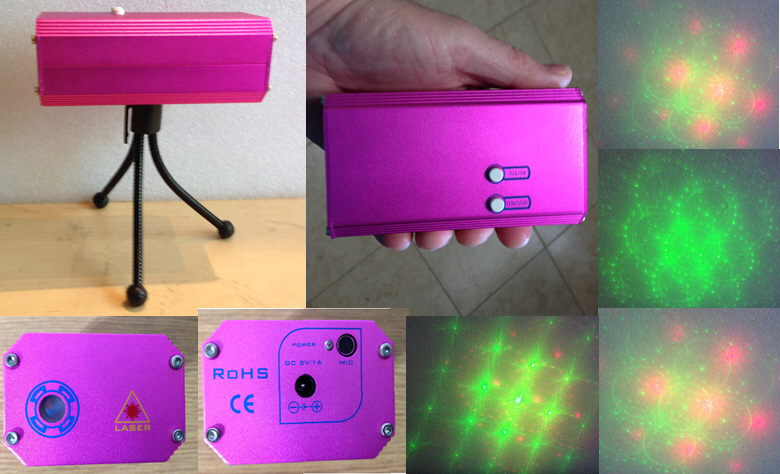 Handheld, portable DJ laser show projector with Red (650 nm ) and Green (532 nm) beams with automatic or area sound control. Perfect for home parties, bars, stores, trade show booths or even nightclubs, the AixiZ laser is your semi professional show solution! The unit uses either AC power OR can be disconnected for a truly portable show that can be used anywhere, anytime! Color: Green, Red Power ON/OFF, AUTO/SOUND, internal microphone and sensitivity control. Micro tripod included.